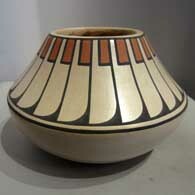 Blue Corn (1921-1999) was a potter from San Ildefonso Pueblo. She was born Crucita Calabaza, the name Blue Corn was given to her by one of Maria Martinez' sisters during her San Ildefonso naming ceremony. Blue Corn made her first piece of pottery at the age of three. She said her grandmother told her, "Your hands were made for pottery." That was a prophetic statement because Blue Corn made pots for nearly her whole life. She was born in that time when many Native American children were being educated in boarding schools. She was educated at the Santa Fe Indian School, about 25 miles from home. Both her parents died while she was away at school and when she graduated, she was sent to live with relatives in southern California. For a while she worked as a maid in a Beverly Hills mansion. 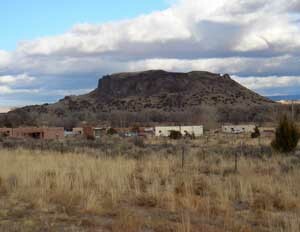 Then she returned to New Mexico and married Santiago Calabazas, a Santo Domingo silversmith. 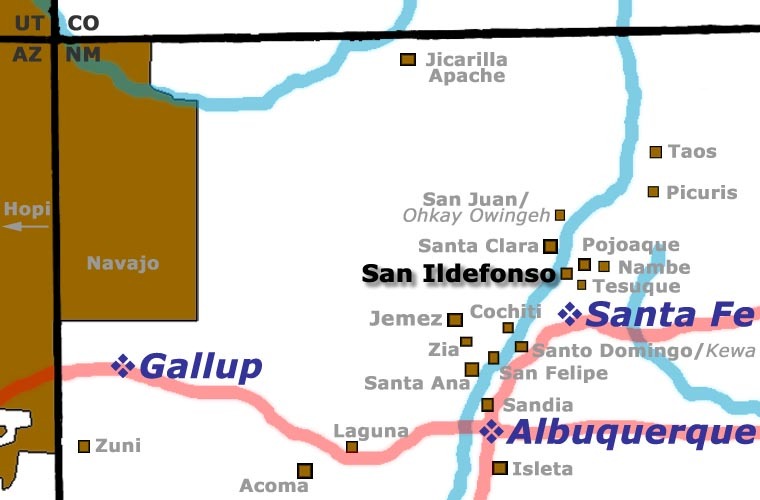 In keeping with Pueblo tradition they lived at San Ildefonso. For a while Blue Corn worked as a housekeeper for J. Robert Oppenheimer, the famous nuclear physicist who was the founder and first Director of Los Alamos National Laboratory. She began making pottery again after her first son, Joseph, was born. Blue Corn was especially known for her polychrome designs on cream jars and plates. She and her husband spent several years experimenting with different techniques, forms, clays and colors. While she produced a significant number of redware and blackware pieces through the years, by the late 1960's she was emerging as a leader in the revival of polychrome pottery. She was known for highly polished white, cream and buff slips, which she said she produced by polishing very slowly. She also selected subtle colors of clay with which to paint her designs. Santiago passed away in 1972 and Joseph took his place in helping her make her pots. Blue Corn was known for making jars, plates, wedding vases, oval blackware lidded boxes and black-on-black owl figures. Her favorite designs included feathers, rain clouds, turtles and the avanyu (water serpent). She did demonstrations and exhibitions all around the country and participated in shows like the SWAIA Santa Fe Indian Market and the New Mexico State Fair, winning major awards at both. In 1981 she was awarded the 8th Annual Governor's Award, the highest artistic honor awarded by the State of New Mexico. When she died Blue Corn had raised 10 children and they had given her 18 grandchildren and 10 great-grandchildren. She had also taught many people how to make pottery, including most of her own children. Some of them went on to become award-winning potters in their own right.